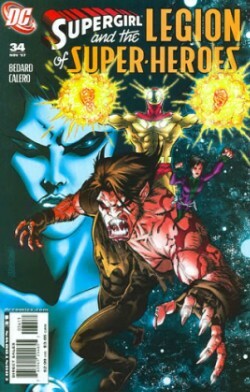 "E.R.G.onomics - Part 1 of 2"
Timber Wolf, Atom Girl and Shadow Lass are on the planet Lallor, fighting with troops. The planet is in the middle of a civil war, the opposing sides fighting over Lallor's entrance into the United Planets and the troops thinking the Legion members were assassins sent to kill the president. Shadow Lass, the Shadow Champion of Talok VIII, uses her stature to get a diplomatic meeting with the president and ask for permission to search the planet for Cosmic Boy. Atom Girl gets a message from Brainy that they're about to be attacked, when ERG-1 shows up to assassinate the president. Timber Wolf recognizes him from photos in Cosmic Boy's office, and ERG explains that he was turned into living anti-energy and wanted to turn his condition into something positive, and so tried to join the Legion. He went with Cosmic Boy, Saturn Girl and Lightning Lad on a mission to destroy a Faminebot from destroying all crops on earth (? ), and in the process his containment suit was cracked and he dissipated into the air, and the Legion members thought he died. And this makes him angry, because he saved earth and then they "abandonded" him. Shadow Lass, Timber Wolf and Atom Girl try to stop him and are quickly defeated, with a portion of the ceiling falling in on Timber Wolf causing him to emerge looking very feral, which seems to be exactly what Brainy expected. Story - 3: Again, Supergirl appears on a video screen in but one panel, so if you're reading only for Supergirl content... move along, there's nothing to see here. The story itself was okay, but not spectacular. The main problem is that I don't believe ERG's motivation at all. His own narration of his tryout mission with the Legion tells us that he understood that Cosmic Boy, Lightning Lad and Saturn Girl thought he died... yet his very next sentence accuses them of abandoning him. If you know they thought you were dead, how can you possibly feel they abandoned you? There's no real logic there. And even if that were the case, this suddenly makes you go from "trying to do something positive with your condition" to being an assassin for hire? Yeah, put it back on the shelf, because I'm not buying it. Art - 4: Good stuff as I've come to expect here. The last page splash of Timber Wolf in the fire is excellent, but I gotta dock a point for the angle and design of Shadow Lass's pants on page 7. Y'know, at that angle with the skin behind the laces, we can tell that she waxes. Everything. Cover Art - 3: I'm curious about this cover, because it's not the one shown in the back of the book in the little blurbs about comics out this week. Ain't that somethin'? I will applaud a most accurate depiction of characters from the issue, which if you've been reading these reviews you know is a long-time pet peeve of mine with this book. My problem with this cover is that I'm really just not all that impressed with the art itself. The coloring on Shadow Lass looks like it was done by a Photoshop novice, Timber Wolf's right hand has a nice manicure (he likes his nails red, ladies), and half the page is just filled with a random outer space background. Just all-around... eh. But hey, good character selection!